I am finally writing about our UK trip after returning almost two weeks ago. I tend to ponder my travels upon return and over analyze said travels to the point of obsession, instead of just enjoying the memories, the photographs and the remembrances of the laughter and the unexpected things that make traveling such an adventure. And, even though this blog is primarily about the design and sense of place that hotels do or do not have, you really can't separate those places from all of the other activities and scenes played out in a faraway and strange land. Although the source cannot be confirmed, somebody British - Winston Churchill, George Bernard Shaw, Oscar Wilde - said "Britain and America are divided by a common language". Well, after our trip, I would add a weak dollar and an insane exchange rate to that quote. Simply said, England is the most expensive place on earth and London is the most expensive city in the universe!!! However, it is possible to enjoy this great country's history, it's people and it's culture without breaking the bank, but you have to do your homework BEFORE you go and then be willing to follow that road less traveled. After spending a wonderful night at The Remont and enjoying the great food Oxford had to offer, we headed out for Chipping Campden in the Cotswolds. The Cotswolds is the most English of any area of England. And Chipping Campden is the most intensely English of all places English in England. It has it all. Narrow cobbled lanes, small shops, organic and ancient plazas, flowers everywhere and a central market square make it an interesting place to stroll and enjoy the day. As we arrived at the outskirts, the beautiful day revealed a storybook like place rendered from a John Constable painting. We spent most of the morning leisurely strolling through this enchanting little town. It seemed that every turn brought some interesting, unique element into view. After purchasing some snacks in a small grocery store for the road trip to Wales, I noticed something. Where were all the thatched roofs? I asked a gentleman at the travel office where I could find these uniquely British architectural creations I had come to expect after reading every travel book from Rick Steves to Karen Brown. 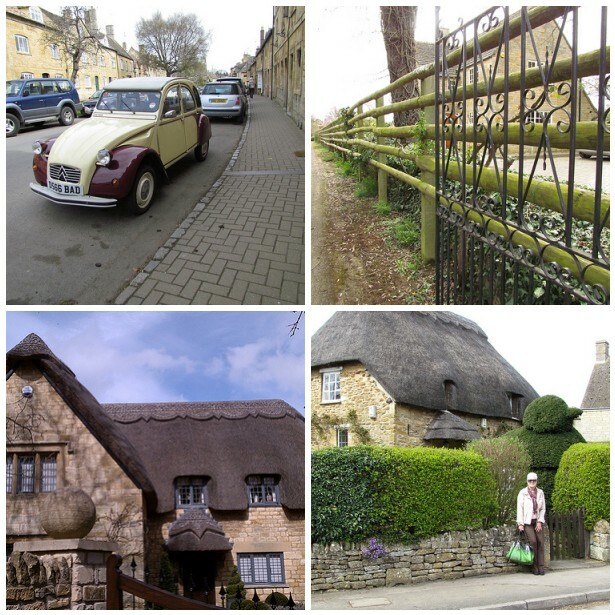 The gentleman explained that many of the "great thatches" have disappeared, but directed us to an area in Chipping Campden where we might see some of these quintessential English architectural gems. After making several U-turns and side trips, we happened on some classic thatched roofed houses of extraordinary character. I was struck by the artistry and detail of this most human of architectural constructions. Borne out of a need to create a cheap roofing alternative in the countryside, thatched roofs have become a symbol of affluence in today's modern England. As you would expect, the history of Thatching is long and interesting. If you don't think it's interesting, reading about it is a great cure for insomnia. Some houses in England have base thatched roofs over five hundred years old. How's that for durability? As we loaded up for the drive to Wales, we said goodbye to - Well, let's just say - If you don't like quaint, stay away from The Cotswolds. In the next post, we'll take you on the first leg through Southern England and Central Wales. Katherine Hepburn said that Wales was the most beautiful place on earth. After this trip, I can see why she came to that conclusion. So stay tuned - you don't want to miss it! This Week's Featured Video Artist is the incomparable James Taylor. In a future post, I will be discussing great Road Trip Music. His double CD - James Taylor Live - is an absolute must to have on anyone's music list for highly improved car travel. I am actually writing this post while sitting at a long wooden table in the living room of an amazing self-catering, minimalist cabin at the Natural Retreats in Yorkshire Dales, near Richmond, UK. More on this incredible place in a future post. This means that I am seriously behind on updating the blog. However, I am an architect, so I am accustomed to being behind schedule. Plus, I have been having entirely too much fun to write anything. So back to the beginning of the trip. Dateline April Fools 2011 - How foolish indeed. After the usual nine hours of the decent into hell on Delta, we arrived tired and jet lagged at Heathrow, met our long lost daughter and took the train to her flat while she is in school in London. After lunch in a nice little restaurant, we picked up the rather large Vauxhaul, made who knows where. After a much needed night of long sleep, we headed out for Stonehenge at 8:00 AM. As we were driving to pick up some coffee and snacks, I had to slam on the brakes to avoid a collision and THE LEFT FRONT WHEEL FELL OFF!!! That's right, the wheel just fell off. I have always felt somewhat charmed when I travel. I am constantly getting room upgrades without asking and other perks that I didn't ask for. Well, sitting at a small shopping center with a broken car our first full day in the UK, it appeared that karma had finally caught up with me. With my stress level in the red zone, my wife, who is NOT the world's foremost optimist, turns to me and says - "Bad beginnings - Good endings", So I am thinking, well we are in a really bad movie that is definitely NOT starting well. But, after three hours of waiting for mechanics and relocation back to the rental agency - good karma shined again. Turns out, all they had to give us as as replacement car was a a sweet little Mercedes Benz. 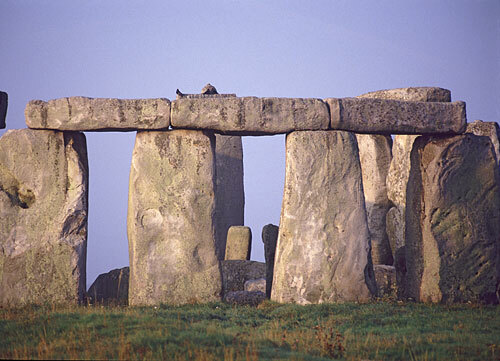 So we struck out for Stonehenge, the mysterious ring of stones designed and built by the ancient Druids. As we were driving down the M4 (UK Interstate), there it was, in the center of a barren field with nothing around, except the M4. As we approached this amazing work of ancient stone, I was struck by the day. Cold, gloomy and windy, it heightened the experience of seeing one of my 1,000 places to see before I die. Older than the pyramids, Stonehenge is intriguing on so many levels. First is the shear beauty. Made of stone megaliths up to 21 feet in length, the man made design appears completely natural. Then there is the still unanswered question - How did they do it? Each stone can weigh up to 44 tons! And finally, exactly what was the purpose? According to experts, it was used for both astronomical observations and ancient tribal rituals. The debates continue. And, as you would expect, there are many legends shrouding this ancient work of art. After viewing "The Big Stones", we struck out for Oxford. This began our deep immersion into the road system of traffic circles (roundabouts), strange road signage and the most aggressive drivers on the planet. We arrived at our hotel two hours later than planned, somewhat "frangie-minded" (a southern term, created by one of my favorite in-laws, which cannot be defined - you just know it when it happens) and in need of some serious R&R. What a relief to arrive at the very well designed and comfortable Remont Oxford Hotel. After checking in, we had a great dinner at a small little restaurant, The Trout, that had been recommended by the very helpful young lady that checked us in. It was a great way to decompress after a very hectic first day of driving. After dinner, we returned to the hotel and it did not disappoint. Like so many hotels in Europe, the Remont Oxford Hotel is a unique combination of old and new. Set in a former manor house, the interiors are models of sleek, simple design. With pure white walls, well crafted details ands furniture, the large sleeping area was intimate and stylish. The use of skylights for windows added to the intimate feeling of the space. 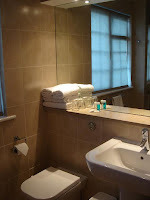 The bathroom was a model of minimalist design with state of the art fixtures, large rain shower and tub. The beds were five star as well. After a peaceful night of much needed sleep, we were treated to a monster breakfast in a very well designed dining space with the same level of detail found elsewhere in this cool little hotel that will definitely go on The Nomad Architect's Keeper List. As we packed up and headed for The Cotswolds, its seemed like a great way to start our trip. The Good Endings admonishment really rang true. Starting with no left wheel, seeing one of the truly great man made achievements in history, driving on the insane UK roads with the even more insane British drivers and finally sleeping in a small, elegant, well run modern hotel in the town of Oxford University, the oldest university in the English speaking world. It was a truly good ending that started very, very badly. Next post on The Cotswolds, when I can get to it. PS - Check out the the video artist of the week, the incomparable Joe Cocker, one of the UK's favorite sons.